The following post was written by Marijo Enderle, our 1L Community Development Representative. 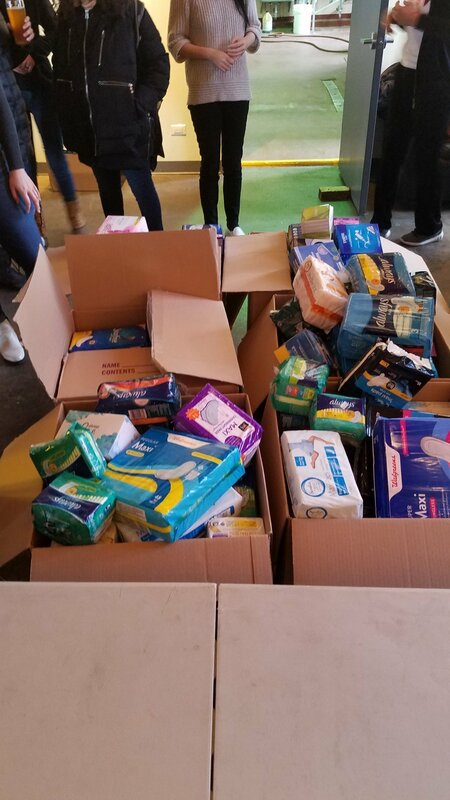 For International Women's Day, the WLC—in collaboration with NLaw student orgs If/When/How and PILG—volunteered with the Chicago Period Project, a local organization that distributes pads, tampons, and other menstrual products to homeless shelters. At Lo Rez Brewing & Taphouse in Pilsen, Northwestern Law students sipped on stouts while helping to count and organize nearly 14,000 hygiene products for distribution to the Olive Branch, the Boulevard Chicago, and Lincoln Park Community Services. From reliable access to bathrooms to finding toilet paper or other makeshift rags, homeless women face an often overlooked struggle to ensure their basic menstrual hygiene every month. While some homeless shelters are able to offer a limited amount of products per month, the amount is often inadequate, especially for women with heavier flows. This lack of access to feminine products can lead to infections, such as yeast and urinary tract infections. Many states designate feminine products as "luxury items" instead of medical necessities, imposing a special sales tax. While Chicago has made some progress in increasing accessibility to menstrual necessities by eliminating the tampon tax, feminine products (and diapers) still remain ineligible for purchase with food stamps. Women should not have to make a choice between their basic hygiene and hunger.